Tag Archive | "Red Tail Hemiodus Tetra (Hemiodus gracilis)"
The Red Tail Hemiodus Tetra (Hemiodus gracilis) is also referred to as the Slender Hemiodus, or Red Hemiodus Tetra by tropical fish keeping enthusiasts, and is found in the floodplains, rivers, and lakes of Venezuela, Guyana, and Brazil, South America. 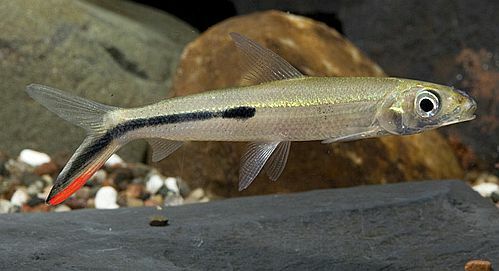 Red Tail Hemiodus Tetras are a peaceful, skittish, shoaling species that are found in large schools in clean, clear, fast moving highly oxygenated waters and streams with some vegetation. 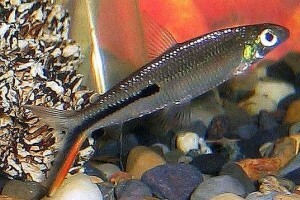 The Red Tailed Hemiodus Tetra has a wiry body that is slightly flattened on the sides with a deeply forked tail. Their body color is silvery with greenish hues, and they have a black band that begins in the middle of the body and ends at the lower edge of the caudal fin. An intense red flap directly below the black band on the lower edge of the caudal fin sets the fish off and gives it it’s common ies name. In their natural habitat Red Tail Hemiodus Tetras can grow over 6″ in length, and when placed in a community aquarium environment, they will often intimidate smaller, more slow moving species. Although it is classified as being Semi-Aggressive, this is probably due to their nervous nature and large size. They are fast swimmers and are actually a quite peaceful schooling fish that can be quite shy. When housed in a single species aquarium, they are best kept in groups of at least 10 or more individuals, and should only be stocked in mature, aged aquariums. In a community tank they can be kept in a larger Amazon biotope setup in small groups with peaceful cichlids like Geophagus, similarly sized characins, Tatanoperca and Heros, catfish, and Loricariids. They also go well with rainbowfish, Bala Sharks, Discus, and Angelfish. They should not be housed with much smaller species. 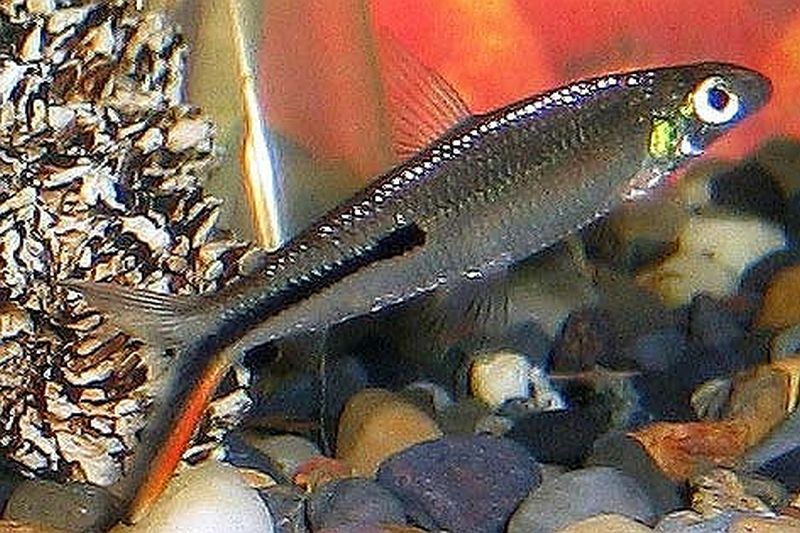 Red Tail Hemiodus Tetras are best housed in a densely planted aquarium of at least 55 gallons with a sandy or fine gravel substrate, with perhaps some driftwood branches and twisted roots scattered around and plenty of swimming space. Some floating plants are recommended to calm down the fish and make them less skittish. They need well filtered, highly oxygenated water to thrive; so a powerhead or two in addition to a canister filter is highly recommended. Red Tail Hemiodus Tetras can leap surprisingly long distances, so a tight fitting cover is also suggested for their tank. Because these tetras require a higher water quality than most fish and are sensitive to poor water conditions, regular partial water changes are recommended as routine maintenance. This is one species that does not do well in small aquariums. Slender Hemiodus have not been successfully bred in an aquarium environment and not much is known about their breeding habits other than the fact that they are egg scatterers. Hemiodus gracilis are carnivores and prefer live foods whenever possible. They will accept a good quality flake food but prefer live, frozen or freeze dried bloodworms , mosquito larvae, brine shrimp, blackworms, etc. Red Tail Hemiodus Tetra (Hemiodus gracilis) are not a common item in tropical fish keeping shops but they can be purchased online and from specialty shops. They are moderately priced and are usually between 1 3/4″ to 4″ in length when available for sale.